This month, Mitzi came up with a super fun theme to play with, and it’s a Bingo Board!! 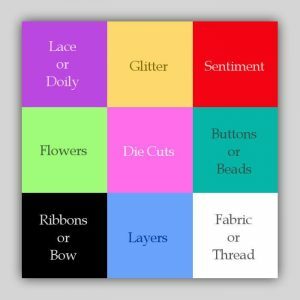 You can use the colors, the elements, or a combination of them both, as long as you make a straight line horizontally, vertically or diagonally!! 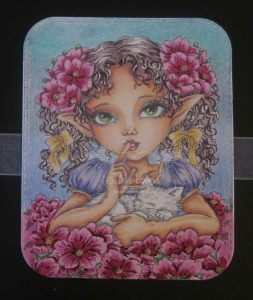 With choices like that, it will be easy to create something for this month’s challenge 🙂 For my card, I used the adorable Primrose Elf, available exclusively at the aurorawings.com store. You can find her in JPG here or PNG here. I mounted this little sweetie on a piece of black CS that I wrapped with a sheer white ribbon, then die cut a window to layer on top, for her to peek through in a piece of white CS. I fired up the old sewing machine and stitched around the aperture and the outer edges of the white piece with some black thread, and popped it up on some foam dots over the black CS and image. I also cut a teal/aqua doily so it fit around the bottom of the opening. 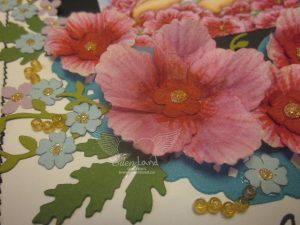 For the flowers, I die cut them, then colored them red and pink to match the primroses in the image, adding glitter to all the centers. I die cut a few different types of leaves from some assorted green scraps I had, and arranged these, along with the primroses and some small punched blue and purple blooms, around the image. 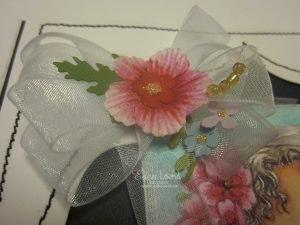 I tied a fluffy bow to balance the top part of the card out a bit, and added a few of the blossoms to it as well. For the beads/button option, I picked through my seed beads to find yellow ones(which, for some reason, were all mixed up, not arranged by color! ), and arranged them in sprays from the flower arrangement. I finished the card off with a sentiment that I stamped with an old CTMH stamp. When I looked at the finished project, I realized that I had managed to implement all the colors in the rest of the card as well!!! Woohoo!! 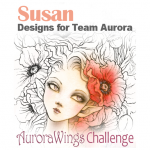 I do hope that you can join us at Aurora Wings Challenge Blog to play Bingo with us!! 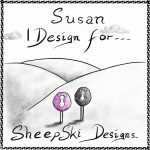 Our challenges are a month long, and have fabulous prizes (Mitzi’s images!! What could be a better prize???). While you’re there, check out the rest of the DT inspiration…..it is absolutely JAW-DROPPING GORGEOUS!!! Previous Post Previous post: S.W.A.K. 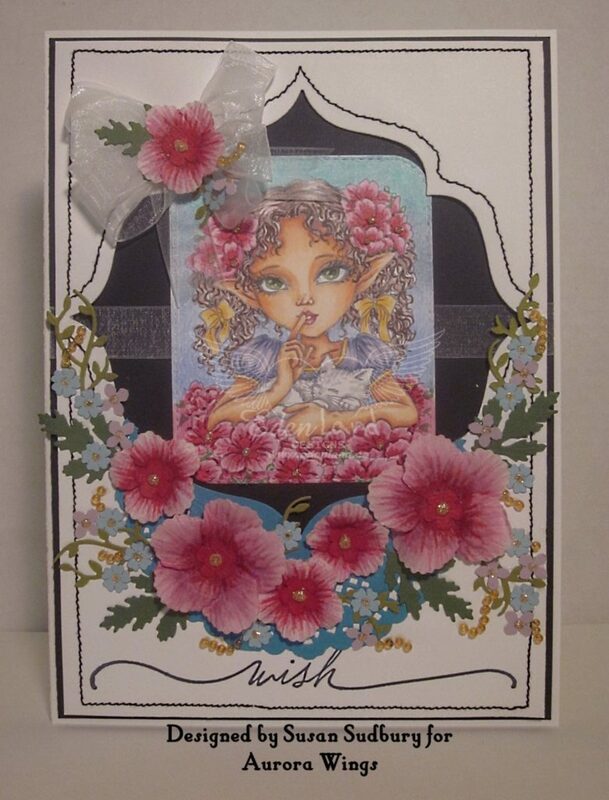 What a pretty card, gorgeous image and love the layered flowers. Thanks so much for joining us this week at Allsorts challenge! 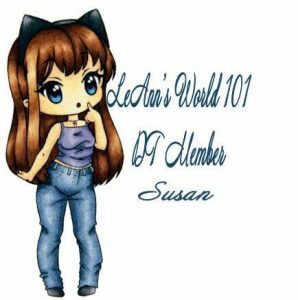 Really lovely creation, a sweet image and well done on the full house. Thank you for joining our ‘Handmade Flowers’ challenge this week at Allsorts. This is just gorgeous. Nice work. Love the design and colours. A beautiful image and such pretty colours and flowers, many thanks for sharing wit us at our ‘Flowers’ theme at Allsorts challenge. 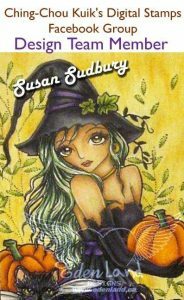 I love this Susan and go you for completing a full house. 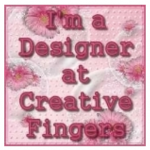 I am so pleased to be working on this fabulous DT with you. You have created a beautiful card to surround such a lovely image. Thank you for sharing with us over here at Classic Design Team Open Challenge and best of luck with your entry. 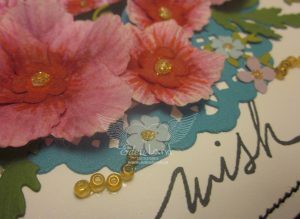 Very pretty card and congratulations on your new DT post. Thank you so much for joining in the Polkadoodles Anything Goes Challenge this time. Hope to see you again. Gorgeous card and beautiful colouring. Congratulations on your new DT post too.